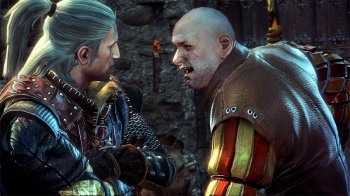 The Witcher 2 on Consoles Only a "Potential"
If you were hoping to play The Witcher on your console, CD Projekt admitted that you might be out of luck. The sequel to CD Projekt's cult PC hit is due out in March 2011. While The Witcher was purely a PC title, the Polish developer strongly indicated that The Witcher 2: Assassins of Kings would get a release on the PS3 and the Xbox 360 for all those people who prefer playing RPGs on their couch rather than at their computer. Even when such a possibility was questioned earlier this year, CD Projekt vehemently restated that the team was still aiming for a console version. Unfortunately, that now seems to be less likely as a senior producer said that playing The Witcher 2 on your console is only a "potential" and that if it does happen, it definitely won't be concurrent with the PC release. "All I can say for now is that it's not likely for any POTENTIAL console release to be simultaneous [with the PC launch]," Tomasz Gop said, senior producer at CD Projekt. This seems to be contradictory to the company's stance earlier this year when The Witcher community said on Twitter in May 2009 that "CD Projekt always wanted and still plans to develop The Witcher 2 on consoles - nothing has changed." A community manager even went so far as to try to completely dispel any bad information: "There are some rumours about us cancelling the console versions. That's just wrong, guys!" It's not all bad, though. While it doesn't seem that CD Projekt is completely abandoning the idea of a console Witcher, it's clear now that Tomasz Gop and his team are concentrating on making The Witcher 2 the best that it can be on PCs. And that's nothing but good news.